In Diamond and Cigar Trades. Excepting in Holland, the creation of a Jewish proletariat has everywhere followed immigration from the east-European centers, where the massing of population gradually led to the formation of a Jewish laboring class. The first union in which mainly Jews were interested, the tailors' union, was founded in 1872. Prior to that date, and for some years after, the Jews had no specific reason for being interested in labor organization. Excepting two, such crafts as the earlier settlers followed called for individual rather than organized effort. These two exceptions were the various branches of the diamond and cigar trades, both of Dutch origin. Diamond-polishing was early subdivided into four branches; and the introduction of steam fostered the natural tendency in this trade toward factory methods. But few men were engaged in the trade at the time of the discovery of the South-African diamond-fields, and the labor system in vogue among them maintained a certain form of mastership for one in every three of the mill-hands. The cigar industry, owing to heavy duties and licenses, was at an early date forced to follow the factory system, although there was little if any machinery employed in the work, and the subdivision of labor was of the simplest kind. 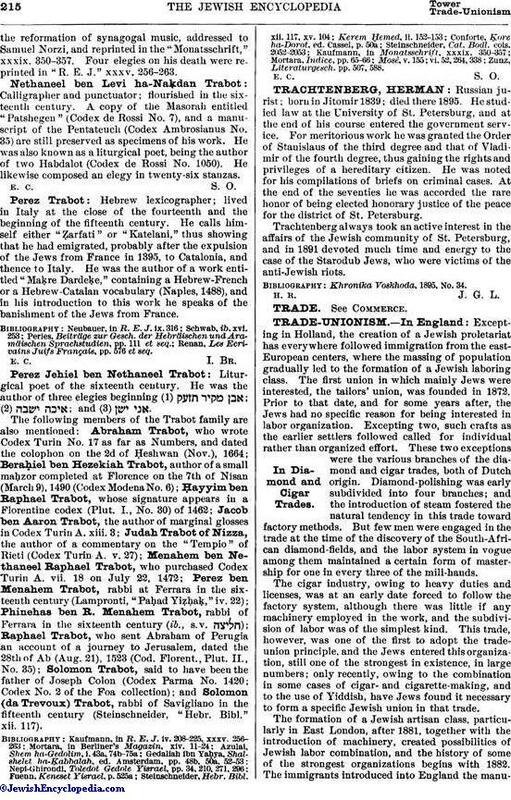 This trade, however, was one of the first to adopt the trade-union principle, and the Jews entered this organization, still one of the strongest in existence, in large numbers; only recently, owing to the combination in some cases of cigar-and cigarette-making, and to the use of Yiddish, have Jews found it necessary to form a specific Jewish union in that trade. (1) That the hours of work shall be reduced to twelve, with one hour for dinner and a half-hour for tea. (2) That meals shall be taken outside the factory premises. (3) That government contractors shall pay wages at trade-union rates. (4) That government contractors and sweaters shall not give out work to be done at home at night after working hours. This strike lasted six weeks, and it seems to have been to the ultimate disadvantage of the Jewish working classes. The history of the movement from that day represents a series of attempts to organize or reorganize, the effort being unquestionably hampered by the fact that the union is estranged from the general trade-unions by the use of Yiddish in all meetings and by the existence of marked socialistic and anarchistic tendencies among the leaders. Of late, however, these have exhibited a well-defined Zionist attitude. In the nineties there were a number of strikes; and in several cases these resulted in shorter hours and better wages. The strikers also made a considerable point of their desire to observe the Sabbath and the Jewish holy days; and in this way they gained the support of the rabbinate. It can not, however, be said that at any time a serious attempt was made to enforce this observance, and it would appear that the pleas of the strikers were more political than religious in purpose. With the growth of immigration there came an increase in the number of the trades in which the Jews were interested, and a corresponding growth in the strength of the trade-union organizations formed. The movement spread to Birmingham, Leeds, Manchester, and other manufacturing cities. Inter-Jewish conferences were held, an attempt was made to bring the Jewish labor movement as a whole under one organization, and the representatives of the Jewish unions were recognized and took part in the general trade-union conferences held from time to time. 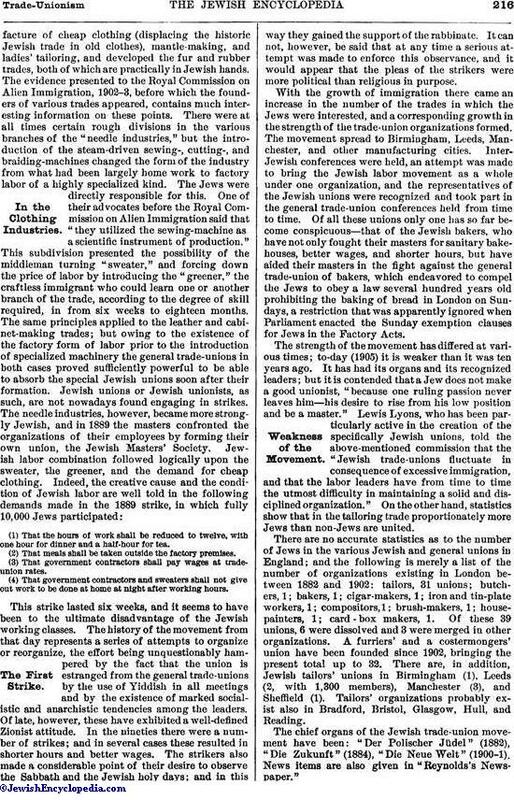 Of all these unions only one has so far become conspicuous—that of the Jewish bakers, who have not only fought their masters for sanitary bake-houses, better wages, and shorter hours, but have aided their masters in the fight against the general trade-union of bakers, which endeavored to compel the Jews to obey a law several hundred years old prohibiting the baking of bread in London on Sundays, a restriction that was apparently ignored when Parliament enacted the Sunday exemption clauses for Jews in the Factory Acts. The strength of the movement has differed at various times; to-day (1905) it is weaker than it was ten years ago. It has had its organs and its recognized leaders; but it is contended that a Jew does not make a good unionist, "because one ruling passion never leaves him—his desire to rise from his low position and be a master." Lewis Lyons, who has been particularly active in the creation of the specifically Jewish unions, told the above-mentioned commission that the "Jewish trade-unions fluctuate in consequence of excessive immigration, and that the labor leaders have from time to time the utmost difficulty in maintaining a solid and disciplined organization." On the other hand, statistics show that in the tailoring trade proportionately more Jews than non-Jews are united. 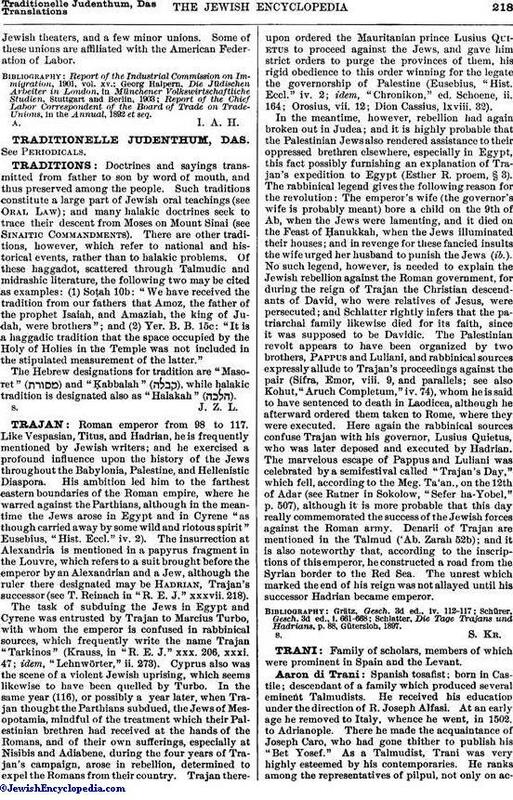 There are no accurate statistics as to the number of Jews in the various Jewish and general unions in England; and the following is merely a list of the number of organizations existing in London between 1882 and 1902: tailors, 31 unions; butchers, 1; bakers, 1; cigar-makers, 1; iron and tin-plate workers, 1; compositors, 1; brush-makers, 1; house-painters, 1; card - box makers, 1. Of these 39 unions, 6 were dissolved and 3 were merged in other organizations. A furriers' and a costermongers' union have been founded since 1902, bringing the present total up to 32. There are, in addition, Jewish tailors' unions in Birmingham (1), Leeds (2, with 1,300 members), Manchester (3), and Sheffield (1). Tailors' organizations probably exist also in Bradford, Bristol, Glasgow, Hull, and Reading. The chief organs of the Jewish trade-union movement have been: "Der Polischer Jüdel" (1882), "Die Zukunft" (1884), "Die Neue Welt" (1900-1). News items are also given in "Reynolds's Newspaper." It is only in the United States and in England that Jews find the opportunity to enter non-Jewish trade-unions in large numbers. In these countries Jewish workers, like others, enter the unions of their various crafts. From their ranks have risen such trade-union leaders as Samuel Gompers (for more than twenty years president of the American Federation of Labor), Joseph Barondess, and Henry White. Jews have shown a special preference for the clothing trades. According to official reports, three-fourths of the workmen in these trades in New York are Jews. In these industries, therefore, the unions are practically Jewish organizations. The first attempts at organization among Jewish workmen antedate the main influx of Jewish immigration into England and America. 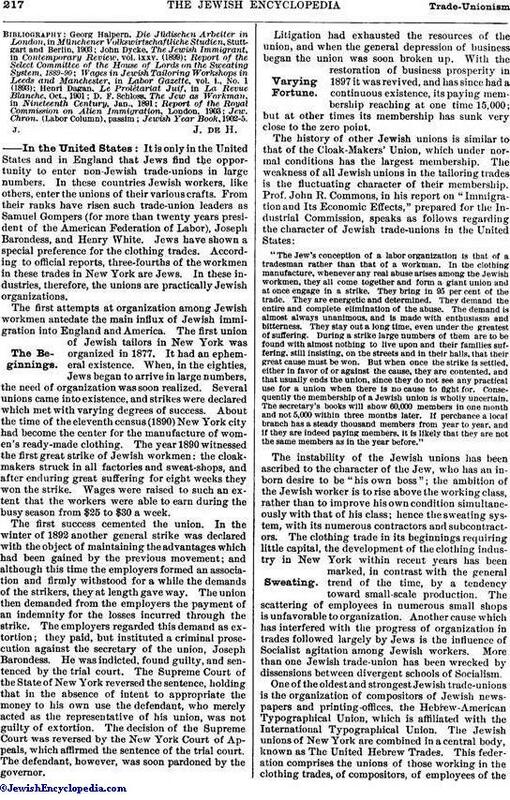 The first union of Jewish tailors in New York was organized in 1877. It had an ephemeral existence. When, in the eighties, Jews began to arrive in large numbers, the need of organization was soon realized. Several unions came into existence, and strikes were declared which met with varying degrees of success. About the time of the eleventh census (1890) New York city had become the center for the manufacture of women's ready-made clothing. The year 1890 witnessed the first great strike of Jewish workmen: the cloak-makers struck in all factories and sweat-shops, and after enduring great suffering for eight weeks they won the strike. Wages were raised to such an extent that the workers were able to earn during the busy season from $25 to $30 a week. The first success cemented the union. In the winter of 1892 another general strike was declared with the object of maintaining the advantages which had been gained by the previous movement; and although this time the employers formed an association and firmly withstood for a while the demands of the strikers, they at length gave way. The union then demanded from the employers the payment of an indemnity for the losses incurred through the strike. The employers regarded this demand as extortion; they paid, but instituted a criminal prosecution against the secretary of the union, Joseph Barondess. He was indicted, found guilty, and sentenced by the trial court. The Supreme Court of the State of New York reversed the sentence, holding that in the absence of intent to appropriate the money to his own use the defendant, who merely acted as the representative of his union, was not guilty of extortion. The decision of the Supreme Court was reversed by the New York Court of Appeals, which affirmed the sentence of the trial court. The defendant, however, was soon pardoned by the governor. Litigation had exhausted the resources of the union, and when the general depression of business began the union was soon broken up. With the restoration of business prosperity in 1897 it was revived, and has since had a continuous existence, its paying membership reaching at one time 15,000; but at other times its membership has sunk very close to the zero point. "The Jew's conception of a labor organization is that of a tradesman rather than that of a workman. In the clothing manufacture, whenever any real abuse arises among the Jewish workmen, they all come together and form a giant union and at once engage in a strike. They bring in 95 per cent of the trade. They are energetic and determined. They demand the entire and complete elimination of the abuse. The demand is almost always unanimous, and is made with enthusiasm and bitterness. They stay out a long time, even under the greatest of suffering. During a strike large numbers of them are to be found with almost nothing to live upon and their families suffering, still insisting, on the streets and in their halls, that their great cause must be won. But when once the strike is settled, either in favor of or against the cause, they are contented, and that usually ends the union, since they do not see any practical use for a union when there is no cause to fight for. Consequently the membership of a Jewish union is wholly uncertain. The secretary's books will show 60,000 members in one month and not 5,000 within three months later. If perchance a local branch has a steady thousand members from year to year, and if they are indeed paying members, it is likely that they are not the same members as in the year before." The instability of the Jewish unions has been ascribed to the character of the Jew, who has an inborn desire to be "his own boss"; the ambition of the Jewish worker is to rise above the working class, rather than to improve his own condition simultaneously with that of his class; hence the sweating system, with its numerous contractors and subcontractors. The clothing trade in its beginnings requiring little capital, the development of the clothing industry in New York within recent years has been marked, in contrast with the general trend of the time, by a tendency toward small-scale production. The scattering of employees in numerous small shops is unfavorable to organization. Another cause which has interfered with the progress of organization in trades followed largely by Jews is the influence of Socialist agitation among Jewish workers. More than one Jewish trade-union has been wrecked by dissensions between divergent schools of Socialism. One of the oldest and strongest Jewish trade-unions is the organization of compositors of Jewish newspapers and printing-offices, the Hebrew-American Typographical Union, which is affiliated with the International Typographical Union. The Jewish unions of New York are combined in a central body, known as The United Hebrew Trades. This federation comprises the unions of those working in the clothing trades, of compositors, of employees of theJewish theaters, and a few minor unions. Some of these unions are affiliated with the American Federation of Labor. Report of the Chief Labor Correspondent of the Board of Trade on Trade-Unions, in the Annual, 1892 et seq.